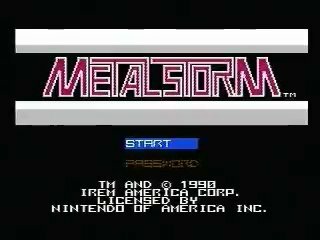 Metal Storm is a creative platformer released by Irem for the NES in 1991. Its most salient feature is the ability to reverse gravity on the fly. Combined with other notable features such as simulated parallax scrolling and totally sweet NES music, Metal Storm manages to impress even today. Best time: Single-segment 0:12:14 by Benjamin 'UraniumAnchor' Cutler on 2014-03-08. Much like Blaster Master I sat on a known improvement for quite some time, but unlike Blaster Master the final push that made me improve it wasn't somebody else beating the record, it was having the game accepted for Summer Games Done Quick 2014 and knowing that if I'm going to be practicing the game I might as well go for an improvement as well. That said, the only major strategy change in is Stage 1, taking extra time to grab the Armor powerup and use it to "instantly" kill the hall guardian, which ends up saving some time. All of the other improvement over the old 12:44 run is mostly bits of polish, but the big timesavers are having a few FAR superior boss fights: Stage 5, Stage 5 refight, and Stage 6 refight. I did slightly tune the route in Stage 5, but it's only a minor timesaver due to the way it affects the laser cycle, and as a bonus is somewhat more consistent. And since a lot of people seem to be confused by it on initial viewing, the reason the Stage 6 boss takes so long is because I can only shoot them when their "eyes" are open, and they're on a fixed timer based on the last time you shot them. So ideally you want them to be open for at little time as possible, but trying to juggle yourself and not hit the floor or ceiling (which is instant death) makes that non-trivial.